Brendan joined the University of Oregon faculty in September of 2006, after 8 years on the faculty at Stanford University. He is particularly fascinated with the diversity of microbial life and much of his research is focused on understanding the causes and consequences of microbial biodiversity. He has research projects around the world, including in the Brazilian Amazon, South Africa, Australia, Michigan, and Oregon. His work has been published in the journals Nature, Science, PLoS, PNAS and many others. Brendan was awarded a Williams Fellowship and a Wulf Professorship in recognition of his teaching at UO, which includes Ecology (BI 370), Community Ecology (BI472/572), and the Philosophy of Ecology (BI410/510, with Ted Toadvine). When not professing, Brendan can be found climbing mountains or digging in his garden. Peg, a member of the UO faculty since 2009, is a wildlife ecologist with a broad, applied background in research, conservation, management, planning, policy, and communications. Her current interests include experiential education, environmental monitoring, wildlife conservation and outreach. She currently teaches ENVS 427 Environmental and Ecological Monitoring, ENVS 429 Environmental Leadership Program (ELP) and UGST 112 Community for Ecological Leaders Seminar. For ELP, she creates and directs service-learning projects relating to conservation science and environmental communication. She also has taught interdisciplinary special topics courses on wolves, ecological restoration, and the McKenzie watershed. She enjoys hiking, backpacking, gardening, cooking, and studying natural history – especially bird-watching and amateur mycology. Scott joined the UO faculty in 2003, after nine years on the faculty at the University of Notre Dame. Before that he was a postdoctoral associate and research associate at the University of Minnesota—Duluth. He is an ecosystem ecologist who has worked historically mostly in wetlands, but currently he also works in terrestrial and aquatic ecosystems. His current research projects focus on climate change effects on ecosystems processes and plant range distributions, the biogeochemistry and microbial ecology of methane production, and restoration ecology. Scott regularly teaches Wetland Ecology and Management (ENVS 465/565), Terrestrial Ecosystem Ecology (ENVS 476/576), and a research methods course for the first-year graduate sequence (ENVS 632). He has also taught Introduction to Environmental Studies: Natural Sciences (ENVS 202). He is an avid whitewater kayaker, runner, mountain biker, etc. Learn more about Dr. Cameron’s research through Google Scholar and Researcher ID. Mark’s research and teaching cross many disciplines to emphasize ways in which historical perspectives improve understanding of present-day environmental issues. His research has analyzed societal effects of glacier retreat and climate change in the Peruvian Andes, examining in particular the effects of natural disasters and water management downstream from glaciers. His current research is funded by a five-year National Science Foundation CAREER grant on global human-glacier interactions, from icebergs and ice sheets in the Polar Regions to the cultural values of glaciers in the Andes and Himalaya. He has also published on mountaineering history, climate therapy and health resorts for tuberculosis, tourism and recreation, and conservation and indigenous people’s land use, as well as serving as a contributing author for the Intergovernmental Panel on Climate Change (IPCC) Working Group II fifth assessment report (2014). His publications span from his award-winning book, In the Shadow of Melting Glaciers: Climate Change and Andean Society (Oxford, 2010), to articles in journals that range from Environmental History, Hispanic American Historical Review, Journal of Hydrology, Annals of the Association of American Geographers, Climatic Change, Canadian Geographer, and Global and Planetary Change, among many others. Alan received undergraduate degrees in Environmental Studies and Biology from the University of California at Santa Cruz before coming to the University of Oregon in 1979 to do his doctoral work on fire and disease interactions in mountain hemlock forests. After short stints teaching at Pacific Lutheran University and Lane Community College, Alan joined the biology faculty at the UO in 1986 where he taught introductory biology for majors and non-majors, upper division forest biology and botany, and an introduction to environmental science course. Alan’s research has examined fire ecology in the coastal California mountains, and the interaction of fire and disease in Oregon. He retired from the University of Oregon in 2016 after 30 years of teaching and administrative work, serving as curriculum director for the Department of Biology from 1997 to 2006 and as Director of the Environmental Studies Program from 2006 to 2015. He continues to work one-third time teaching a lab/field course in forest biology and a forest ecosystem management course for the Environmental Studies program. In his spare time, Alan enjoys gardening, canoeing, fly-fishing, and pretending to learn to play piano. Lauren is a plant community and restoration ecologist who joined the University of Oregon faculty in the Fall of 2017. The goal of her lab is to produce “usable” science to improve ecosystem management. Lauren’s research spans a variety of systems, including working rangelands, serpentine grasslands, woodlands and alpine. Her research themes include: community assembly, functional traits, species coexistence, ecosystem stability, and resilience theory. She uses a combination of long-term data analysis, population modeling and field experiments to this end. Stephanie LeMenager is Barbara and Carlisle Moore Professor of English at the University or Oregon, where she teaches courses in the interdisciplinary field of the Environmental Humanities. Professor LeMenager has written three books: Manifest and Other Destinies (2005), winner of the Thomas J. Lyon Prize for Best Book in Western American Literary Studies, Living Oil: Petroleum Culture and the American Century (Oxford, 2014), and Environmental Criticism for the Twenty-First Century, which she co-edited with Teresa Shewry and Ken Hiltner. She is a founding editor of Resilience: A Journal of the Environmental Humanities and is currently at work on a book about the ecological value of literature, titled Weathering. Katie, a member of the UO faculty since 2005, is an environmental anthropologist and has worked in Peru, Ecuador, Indonesia and the United States examining issues of community-based natural resource management. Her research interests include tropical conservation, gender and natural resource issues, ethnobotany and the cultural uses of wild plants, ecofeminism, critical pedagogy and engaged environmental education. She currently teaches environmental education in theory & practice (ENVS 425/525) and directs a wide variety of service-learning projects as part of the Environmental Leadership Program (ENVS 429). She has a strong commitment to participatory, collaborative and interdisciplinary approaches and is completely inspired by the truly spectacular landscapes found all over Oregon. Kathy is a practitioner and applied researcher with experience in working with rural, resource-based communities and Native American tribes in the Pacific Northwest to address social, environmental and economic issues associated with climate change. Kathy coordinates the Tribal Climate Change Project, a collaboration with the USDA Forest Service Pacific Northwest Research Station. The project focuses on building an understanding of the needs, lessons learned, and opportunities that American Indian tribes and Alaska Native communities have in planning for the physical effects of climate change and reducing greenhouse gas emissions. Through this project, Kathy facilitates the Pacific Northwest Tribal Climate Change Network, which is comprised of tribes, tribal organizations, public agencies, and non-governmental groups throughout the Northwest and from across the country. Kathy has a Masters degree in Community and Regional Planning from the University of Oregon and served as a Peace Corps Volunteer in Haiti from 1996 to 1999. She lives in Eugene, Oregon and is mother to two lovely little girls. Richard holds a Ph.D. in planning from the University of Wisconsin—Madison, where his dissertation examined collaborative approaches to environmental management. He worked for the Wisconsin Department of Natural Resources for three years on watershed management and growth management. In 1995 he moved to Australia as a postdoctoral Fulbright fellow, and later joined the faculty of the Queensland University of Technology. His research in Australia focused on collaborative approaches to watershed management and regional growth management. He is currently an Associate Professor and Department Head for the Department of Planning, Public Policy and Management Department at the University of Oregon. He has published over 20 articles and book chapters on collaborative planning, environmental planning and growth management and continues to focus on planning process, conflict management, and institutional and coordination issues. In a national study of planning departments, Dr. Margerum was ranked in the top 50 of faculty for the number of journal article publications. Richard has conducted research in collaboration with several Oregon watershed councils; he is the past Chair of the Steering Committee for the Long Tom Watershed Council. In 2007-08, he was a Visiting Scientist with the Australian Commonwealth Scientific and Industrial Research Organisation (CSIRO), where he worked with researchers on regional natural resources along the Great Barrier Reef coastline. Pat is a physical geographer with a Ph.D. from University of Wisconsin. Her specialty is fluvial geomorphology. She teaches courses on geomorphology, fluvial geomorphology, and watershed science and policy. Her research is based on field work and GIS analysis, and she has conducted research in many parts of Oregon, as well as Alaska, the Midwest, and New England. Her current research focuses on river channels and floodplains, human impacts on rivers, and river restoration. She has had research grants from the National Science Foundation, U.S. EPA, U.S. Forest Service, U.S. Army Corps of Engineers, and the Oregon Watershed Enhancement Board. She has served on several National Research Council panels studying river policy problems. She has served as department head of Geography and as Associate Vice President for Research at the University of Oregon. She is a strong supporter of local river action groups through service on advisory committees for several local watershed councils and a land trust. Ron has published International Politics and the Environment (Sage, 2009), International Environmental Politics (Sage, 2008), Global Environmental Assessments: Information and Influence (with William Clark, David Cash, and Nancy Dickson, MIT Press, 2006), and Intentional Oil Pollution at Sea: Environmental Policy and Treaty Compliance (MIT Press, 1994). He was the University of Oregon’s commencement speaker in 2008. He has published numerous articles and chapters in edited volumes. His current research interests include the effectiveness of international environmental agreements (focusing at present on climate change, fisheries, and transboundary air pollution) and he has developed a database of all multilateral environmental treaties and corresponding performance indicators. He is the co-director (with C. Susan Weiler of Whitman College) of the Dissertation Initiative For The Advancement Of Climate Change Research (DISCCRS) program which helps new scientists working on climate change develop interdisciplinary skills to improve their understanding of, and ability to help solve, the problem of climate change. He teaches courses on international relations, international environmental politics, and international organization. Erin E. Moore is an associate professor in the Department of Architecture and in the Environmental Studies Program and is Head of the School of Architecture and Environment in the College of Design at the University of Oregon. Moore works in teaching, research and creative practice on the life cycle environmental context of building construction and on the ways that buildings shape and reflect cultural constructions of nature. She uses her architecture practice FLOAT architectural research and design as a testing ground for designing with explicit intentions for the ecological context of buildings. Recent work explores the architectural space of fossil fuel consumption, biogenic carbon sequestration, and climate change including the studio course “Lines: Lines, Pipelines, and the Contested Space of Fossil Fuel Transport in the Pacific Northwest,” the paper “Geologic Time is No Longer Slow Time,” and the installation “OUR: Collective Future Project” for the for the Dhillon Marty Foundation under the aegis of UNESCO’s Management of Social Transformations (MOST) programme (2017). Moore was an invited contributor to the art and architecture section of the United Nations Experts’ Report on Harmony with Nature (2016). In the face of serious global challenges, Moore believes that it is especially important to develop aggressive, creative innovators who can connect the power of design with good science and rigorous ethical thinking. In her own teaching, Moore works to bring together processes of design and innovation with the science of sustainability in collaborations with chemists, ecologists, and biologists. Her class Molecular Innovation in Material Lifecycles(2013) was a collaboration with chemist Julie Haack. Her class Ecology of Building Materials: Wood (2015) was a collaboration with wood scientist Suzana Radivojevic. Moore has developed a natural history-based introductory design curriculum for the graduate studios, teaches in the terminal (or integrated design) studio sequence on topics related to ecology and global climate change, and teaches the large lecture course Introduction to Building Construction with a focus on connecting material ecology with human experience. Moore’s architectural design work has been published in 100 Contemporary Green Buildings (Cologne: Taschen, 2013), Architecture Now! 2 (Cologne: Taschen, 2011), Small Eco-Houses, (NY: Universe, 2010), Tiny Houses (NY: Rizzoli, 2009), New Prefab (Barcelona: Loft, 2008), and in Dwell, and Architectural Record magazines. Her Equilibrium Pavilion proposal was given a Material Equilibrium prize by architect Kengo Kuma (2013), her Borrow Stools were shortlisted in the 2014 Lexus Design Awards, and the OUTSIDE HOUSE pavilions were awarded first prize in the Building Voices design competition by Rural Studio director and jury chair Javier Vendrell (2017). Moore is a graduate of the University of California-Berkeley (Master of Architecture) and of Smith College (BA, American Studies) and is a registered architect in Oregon and Arizona. Nicolae received his B.A. and M.A. from Université Jean Moulin Lyon 3 in France and has recently earned his PhD in Philosophy from Purdue University. His dissertation analyzes the ways in which biotechnologies alter traditional conceptions of human nature. In his current work, Nicolae approaches the notion of human nature from various perspectives: at the limit between non-human animals and humans, where he proposes a more radical solution to the moral conundrum raised by genetic chimeras; at the limit between humans and more than humans, where he claims that the argument from human nature fails to characterize genetic altering techniques as morally reprehensible. Nicolae also proposes a positive account of human nature from a biological perspective, where instead of focusing on essential similarities, he uses the notion of norm of reaction to capture the variability at heart in every human population. Nicolae has several on-going projects. He is coauthoring a paper with Dan Kelly analyzing the roles disgust (the yuck factor) should be given in our society. He is also co-editing three books. In New Directions in Biopower: Ethics and Politics in the Twenty First Century, Nicolae and V. Cisney intend to offer a book that outlines a coherent, comprehensive, and unified account of the concept of biopower by drawing together into one text the major thinkers working on this topic. In Between Deleuze and Foucault, Nicolae, along with Thomas Nail and Daniel W Smith, addresses the critical deficit regarding the convergences and confrontations of two of the towering figures of French intellectual life in the later half of the twentieth century. The same intention drives Nicolae and V. Cisney in Between Foucault and Derrida.Nicolae’s areas of specialty are in applied ethics, recent continental philosophy, and philosophy of biology, and his interests lie also in ethics, social and political philosophy, theories of sexuality, and critical theory.In the Fall, Nicolae will be teaching Environmental Ethics (ENVS 345), and he will also offer courses through the philosophy department in the winter and spring quarters. 2) Sustainability Theory and the International Degrowth Movement: my current research focuses on crisis scenarios beyond economic growth and the role of new social movements for a social-ecological transformation. Alexandra is a building scientist investigating the lessons that existing buildings, vernacular design practices, and solar resource patterns hold for contemporary climate-responsive design. Her research efforts in passive solar heating, passive cooling, and natural ventilation combine field studies with energy modeling to reveal patterns that cannot be found by either method alone; this work has been published in Building and Environment, Geosciences, and Renewable Energy. She is a member of the university’s Science Literacy Program and the secretary and treasurer of the Society of Building Science Educators; she has previously taught in the School of Architecture at Rensselaer Polytechnic Institute and worked in green building practice at Solarc Architecture and Engineering. She holds a Ph.D. in Biology from MIT and an M.Arch. from the University of Oregon. Josh joined the UO faculty in 2001 and is a geomorphologist with NSF- and NASA-funded projects in New Zealand, Northern California, South Africa, and Oregon. His research interests include landscape evolution modeling, quantitative topographic analysis using airborne laser altimetry, and biotic and climate controls on sediment production. Josh serves as an associate editor for the journal Earth Surface Processes and Landforms. In 2005, Josh received the University of Oregon’s Ersted Award for distinguished teaching. He regularly teaches Environmental Geology (GEOL 102), Earth and Environmental Data Analysis (GEOL 418/518), Hillslope Geomorphology (GEOL 441/541), and Tectonic Geomorphology(410/510). He enjoys playing tennis, listening to Neil Young LPs, and following the Minnesota Twins. Kory C. Russel is an Assistant Professor of Landscape Architecture and Environmental Studies at the University of Oregon. Kory teaches Design for a Sustainable World (LA 199), Sustainable Design Principles and Practice (LA 410/510), Tech workshop in Water, Sanitation and Health (LA 459/559) and Water, Public Health and the Environment (ENVS 410/510). His primary research focuses on planning, designing, and implementing sustainable water and sanitation (WASH) services in low- and middle-income countries. Additionally, Kory is the co-founder of the “re.source sanitation” research initiative originally funded by the Bill and Melinda Gates Foundation focused on extremely low-cost, container-based sanitation services in dense informal settlements. His other research topics include 1) water, energy, and resource recovery from waste streams; 2) sustainable delivery of water services in rural and urban settings; 3) development and analysis of entrepreneurial-based sanitation service delivery models; and 4) caloric costs of water fetching. He has conducted extensive research internationally including in Haiti and Mozambique. He also spent 3 years in Mozambique serving as a Peace Corps volunteer. Emily Eliza Scott’s research focuses on contemporary art and design practices that engage pressing (political) ecological issues, often with the intent to actively transform real-world conditions. More broadly, it addresses art and the public sphere, critical approaches to the built environment, visual cultures of nature, social and environmental justice, and the capacity of art to produce non-instrumental forms of sensing and knowing. Prior to joining the UO in 2018, she was a Visiting Professor at the VU University Amsterdam, a Postdoctoral Fellow at the Inst. for the History and Theory of Architecture at the Swiss Federal Inst. of Technology (ETH Zurich), and earned a PhD in post-1945 art history from UCLA in 2010. Her writings have appeared in Art Journal, Art Journal Open, American Art, Third Text, The Avery Review, Field, and Cultural Geographies as well as multiple edited volumes and online journals; her first book, Critical Landscapes: Art, Space, Politics, coedited with Kirsten Swenson, was published by the Univ. of California Press in 2015. At present, she is developing a monograph on contemporary art and geological imaginaries and a coedited volume on contemporary art, visual culture, and climate change. She is also a core participant in two long-term, collaborative, art-research projects: World of Matter (2011-), an international platform on global resource ecologies; and the Los Angeles Urban Rangers (2004-), a group that develops guided hikes, campfire talks, field kits, and other interpretive tools to spark creative explorations of everyday habitats in their home megalopolis and beyond. Before entering academia, Scott spent nearly a decade as a National Park Service ranger in Utah and Alaska. Lucas joined the UO faculty in 2016 after three years on the faculty at the University of California Davis. He is a terrestrial ecologist who investigates how dynamic soil-plant-atmosphere relations control the functioning of, and services provided by, natural and managed ecosystems. His research and teaching activities focus on: the impact of rising carbon dioxide and nitrogen deposition on the physiological performance of plant species; the role of soil properties in determining vegetation distribution and productivity under changing climates; and analyses of ecological and biogeochemical alterations caused by human disturbance across biomes. Dave is a physical oceanographer who joined the UO faculty in 2011. His research interests are focused on understanding how coastal circulation interacts with various estuarine environments and how the physical dynamics control biological, chemical, and geological processes (e.g., larval transport, temperature and salinity variations, water quality, ecosystem services, etc.). Current projects center on the Coos Bay estuary in Oregon, and several fjord systems in Greenland, as well as Puget Sound, which is a fjord system closer to home. He teaches two introductory classes (ENVS 202 and GEOL 307), and is developing more advanced courses on estuarine and coastal oceanography and fluid dynamics. Sarah first experienced Oregon in 1997 when she arrived to study at Reed College. She quickly became a devotee of the Pacific Northwest. In 2009, she received a PhD in American Studies from Brown University. After 5 years of teaching in New Jersey and Kentucky, Sarah was excited to return to Oregon in 2014 to join the UO faculty. Sarah’s research focuses on the intersections of Race and Ethnic Studies with the environmental humanities. She has a particular interest in the environment in Asian American and Latinx literature and culture. She is the author of The Nature of California: Race, Citizenship, and Farming since the Dustbowl (U Washington Press, 2016). She is currently editing a volume on Latinx Literary Environmentalism and working on a monograph about the equity, diversity, and inclusion efforts of public lands advocacy organizations and outdoor recreation. Her publications include an article on service learning in the literature classroom and she prioritizes community-based learning in the classroom. Sarah has been working to protect the waters and wildlife of Mt. Hood National Forest for over a decade as a volunteer and board member of Bark. 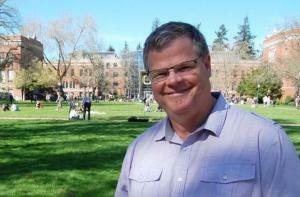 Peter joined the UO faculty in 1997, after receiving his Ph.D. from UC Berkeley in geography. His research interests are in environmental politics and concepts of nature in Africa and the American West. He regularly teaches introduction to environmental studies: social science (ENVS 201), political ecology (ENVS 450/550), historical and contemporary ideas of nature (Geography 462/562), Sustainability (ENVS 410/510), Geography of Africa (Geography 462/562), Population and Environment (Geography 341), Perspectives on Nature and Society (ENVS 420/520), and seminar in political ecology (ENVS 607). Marsha Weisiger joined the University of Oregon faculty in 2011 as an environmental historian and the Julie and Rocky Dixon Chair of U.S. Western History and Associate Professor of History. She teaches courses in environmental history, the American West, Native American history, and the art of writing history. She received her Ph.D. in history from the University of Wisconsin-Madison, an MA in history from the University of Oklahoma, and BA degrees in anthropology (archaeology) and history from Arizona State University. Before coming to Oregon, she taught history for many years in southern New Mexico. Her current research focuses on western rivers and the meaning of “wildness,” and she is also working on a study of the intersections of the 1960s-70s counterculture and environmentalism, including such subjects as the Hoedads tree-planting collective and reclamation art. She is most recently the author of the award-winning Dreaming of Sheep in Navajo Country, an environmental history of livestock grazing and conservation policy. Previous publications include the prize-winning Land of Plenty: Oklahomans in the Cotton Fields of Arizona, 1933-1942, a social and labor history. For many years she worked as a consultant and administrator in historic preservation and is principal author of the forthcoming Buildings of Wisconsin. She is a strong advocate for bringing historical insights to environmental debates and in 2003 organized a symposium at New Mexico State University, “Leopold Forum: El Lobo,” which brought together historians, scientists, ranchers, environmentalists, and government officials for a public conversation on the past, present, and future of the endangered Mexican Gray Wolf. She is currently a member of the editorial board for Environmental History and serves on the Council of the Western History Association. She is an avid river runner (a swamper, really), and loves camping, biking, and walking with her border collie, Maia, along the Willamette River. Richard grew up in Oregon. He joined the UO in 2002. His research focuses on environmental sociology, ecological economics, animal studies, and the sociology of science. He was the 2013-14 Friends of the Institute for Advanced Study Member of the School of Social Science at the Institute for Advanced Study, the Chair of the Environment and Technology Section (ETS) of the American Sociological Association (ASA) in 2013-14, and the Co-Editor of the journal Organization & Environment from 2006 to 2012. He has published dozens of articles, including ones in American Sociological Review, Ecological Economics, Conservation Biology, Nature Climate Change, Social Problems, Sociological Theory, and Theory and Society. He has published three books with Monthly Review Press: The Critique of Intelligent Design and The Ecological Rift, both with John Bellamy Foster and Brett Clark, and The Science and Humanism of Stephen Jay Gould with Brett Clark. In recognition of his research, he has received the Outstanding Publication Award twice (2004 and 2007) and the Honorable Mention for the same award once (2011) from the ETS of the ASA, the Rural Sociology Best Paper Award (2011) from the Rural Sociological Society, the Distinguished Scholarship Award from the Section on Animals & Society of the ASA (2015), and the Honorable Mention for the Lewis A. Coser Award for Theoretical Agenda Setting from the Theory Section of the ASA. He has also received the Teaching and Mentorship Award (2011) from the ETS of the ASA, and the Thomas F. Herman Faculty Achievement Award for Distinguished Teaching (2013) and the Faculty Excellence Award (2013) from the University of Oregon.